Since 1917 Tsubakimoto Chain Company has consistently provided the highest quality industrial chain. Being the global leader in innovation, Tsubaki became the world's first manufacturer to introduce lube free chain under the brand name Lambda in 1988. The Lambda chain is ideal for environments where chain lubrication is difficult, impossible or undesirable. Typical applications can be found in industries where clean environments are required (e.g. food, packaging) and in environments where abrasive contamination is prominent (e.g. wood processing, paper industry). Tsubaki is now proud to introduce the 6th generation premium Lube Free Lambda Chain that will be supplied as standard with a special developed NSF-H1 Food Grade lubricant impregnated bush. The microscopic pores in the seamless sintered bush are vacuum filled with high performance H1 food grade lubricant, which provides a 30% increase in wear-life performance. The special coating on the pin surface enhances the long term internal lubrication. The unique centre sink pin design offers easy chain disassembly and the markings on the rivet head will identify pin rotation. The patented Ring Coin connecting link ensures that the chain can be specified up to its full chain capacity. As a result of the upgraded lubricant to NSF-H1 as standard, the wear life of the New Lambda chain increased by 30% [a] while maintaining the same chain strength. 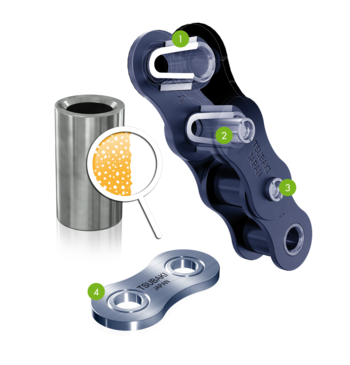 Limited initial elongation results in the reduced need for post installation maintenance (less chain / sprocket adjustment) and contributes to the overall increased wear life time [b]. The elongation pattern of Tsubaki's Lambda chain is extremely stable. This minimizes the need for intermediate chain and sprocket adjustment. 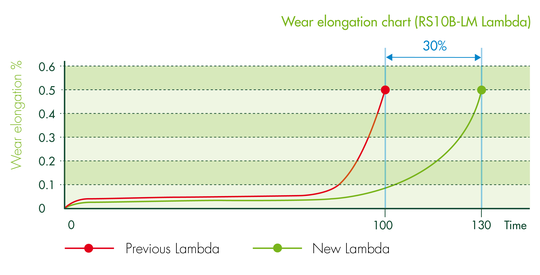 [a] Average increase compared to the previous generation of Lambda chain (including Lambda NeptuneTm, excluding heat resistant Lambda). [b] This is applicable for attachment chains until RS16B-1. The New Lambda brochure is available for download here. Press Release is available for download here. For more information please contact the Tsubaki representative in your region.